An estimated 8,572 premature deaths occurred in four major Chinese cities in 2012, due to high levels of PM2.5 pollution, a joint study by Greenpeace East Asia and Peking University’s School of Public Health has concluded. The report also estimates PM2.5 pollution caused the cities of Shanghai, Guangzhou, Xi’an and Beijing to suffer a combined total of US$1.08 billion in economic losses over the past year. Greenpeace is calling for an urgent policy adjustment, including capping regional coal consumption, De-NOx retrofiting for existing coal-fired power plants, and shutting down inefficient coal-fired industrial boilers. The report “PM2.5: Measuring the human health and economic impacts on China's largest cities” states that if these cities can effectively lower their PM2.5 levels to meet the World Health Organization’s Air Quality Guidelines (WHO AQG), such deaths would be reduced by at least 81%, and the economic losses for these four cities could be reduced by $US868 million. Unfortunately no cities currently have a timeline to meet WHO AQG. “PM2.5 is putting public health at high risk every day, but worse still, if we follow the current official plans we would need to wait 20 years to get to the national standard, which is still risky compared to the WHO guidelines,” said Greenpeace campaigner Zhou Rong. “Who can afford the wait?” Greenpeace is calling for a concrete and ambitious timetable to tackle PM2.5 pollution, thus improving the air quality to reach the health standard set out by WHO AQG. For the report, researchers from Greenpeace and Peking University’s School of Public Health studied the impact of PM2.5 in Beijing, Shanghai, Guangzhou and Xi’an, which represented major urban centres in China’s north, east, south and west respectively. “Besides saving a lot of human lives, combating PM2.5 can also significantly reduce the national cost on health care,” said Zhou Rong. Taking Beijing as an example, the report found the Chinese capital experienced a loss of US$328 million in 2012 because of PM2.5 pollution. But had it reached WHO AQG, US$283 million could have been saved. (For details please refer to the media briefing paper section three). Recent statistics from China’s Ministry of Environmental Protection (MEP) show cities in China’s Yangtze River Delta, Pearl River Delta, and Beijing-Tianjin-Hebei region suffered over 100 hazy days a year with PM2.5 concentration two to four times above World Health Organization guidelines. The effects of PM2.5-related air pollution extend beyond hazy days, also leading to systematic damage to human health. PM2.5 is small in particle size but as pollution can reach a large surface area. It is more prone to carrying a variety of toxic heavy metals, acid oxides, organic pollutants and other chemicals, as well as microorganisms such as bacteria and viruses in the air. When inhaled, it can enter a person’s blood stream. Exposure to PM2.5 can contribute to cardiovascular, cerebrovascular and respiratory diseases, as well as greater cancer risks, all leading to a significantly higher mortality rate. 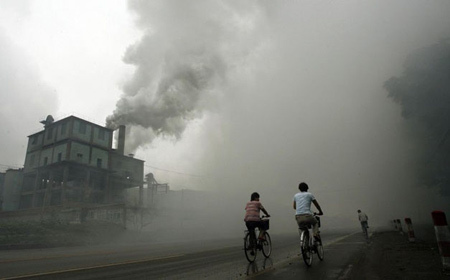 Studies have shown PM2.5 is most prevalant in the combustion of coal. Since the majority of China’s energy comes from coal plants, Greenpeace is urging regional governments to cap coal consumption. Greenpeace is also calling on the local governments in key regions to go beyond requirements raised by recent MEP plans, and to take ambitious steps to set up specific air quality improvement plans, including detailed PM2.5 pollution reduction timelines.